On Thanksgiving afternoon one of my dogs went into my small back yard and started barking like crazy (she's not a chow) so I went to check and her red chowchow sister, who is 3 1/2, was having a grand mal seizure. She was on the ground on her side, twitching and slobbering and barely conscious. She probably seized for two or three minutes; I was with her for the last minute or so. After she regained consciousness I helped her into the house carefully, as she was disoriented and didn't seem to know where she was or who I was. I cleaned her up gently and she explored her surroundings and my other dogs until, after about five hours, she seemed back to her old self. I don't think she ate anything poisonous: I remember that when younger she had a few minor seizures, usually while asleep. Per Google, without an MRI the vet's guess will be as good as mine. We'll go to the vet Monday when they reopen, or to Pet Emergency if she has another. It was scary, but I'm pretty calm under stress and now she's fine. She was a runt and has been through entropion eye surgeries and knee surgeries and has the hips of a ten year old dog at 3-1/2 yrs. Oh well I loved her sweet self to bits. Are chows a breed prone to seizures? I am so glad I insured her when I got her at nine weeks old. We wish you both the best. I am very sorry to hear that. Did the vet give you any good news on Monday? How is your Chowgirl doing? Is she eating? My Chowboy had a seizure. The vet suspected a brain tumor but also found a large mass near his lung in an x-ray. The oncologist said there was probably a brain tumor and the lung mass was suspicious...they could do tests but it was over 7 days since my boy had eaten. He would never survive the tests let alone the treatment. Hope our situation is not the same. A friend that rescues Golden Retrievers said one of his dogs has seizures but comes out without issues. It's just horrible thing to experience our fur babies going thru it. I am so sad to hear your chow has such. She will have it forever BUT can be lessened by medication. I hope you will not breed her as it can be passed on to her pups and grandpups. I can't help but reflect on the fact that such condition is unheard of in my country's native dogs. I wonder if it has something to do with breeding them to dogs with such a condition or both have it and it got passed on to their progeny. Ruth, I'm so sorry to hear of your baby's health struggles at such a young age. I can only assume due to overbreeding. 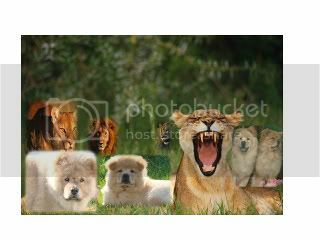 I've had several mixed breed dogs (I'm older and so were they when they passed), now have a 4 year old rescued full bred chow chow with bad hips, partially torn ligament and sebaceous adenitis. I'll never get another purebred. Point I wanted to pass on though was that One of my dogs did have a few seizures in her adulthood which she recovered from fully. The vet compared them to human mini strokes but did not recommend any medication or anything. She lived to a ripe old age but finally had a bad one that she could not recover from. Hopefully you will have many more good years with her. I have a girl who experienced similar seizures. Sadly they lasted for several hours. Luckily she recovered quite nicely and has never had another. It was heart breaking as Amber is a true sweetheart and we had plans for her to be part of our breeding program. We absolutely love her look, she has a very pretty face and a nice sorta slight build with great bone structure. We never identified what caused the seizures that day, I suspect that she ate something, possibly sacarin or a similar chemical that is poisonous to dogs, but I can never risk putting the seizure risk into puppies. Amber has other traits that I don't love, she is a bit edgy, sounds like cell phone beeps put her on alert. She used to really get upset when I sneezed. She is steadfast and determined. When she wants to go upstairs she will claw the wall or chew a table. When crated she will dig relentlessly, even when in the truck where she wanted to be to go on a road trip just minutes before. Seizures are hard to figure. 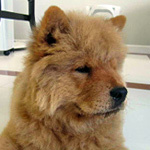 I did have a prior male Chow that experienced them later in life, and it turned out he did have a tumor. With Amber, I think the wiring just isn't right, but she has only had the seizures that one time. She may have a neurological issue, but I still think they were brought on by something she ingested. kingalls wrote: How is your Chowgirl doing? Is she eating? My Chowboy had a seizure. The vet suspected a brain tumor but also found a large mass near his lung in an x-ray. The oncologist said there was probably a brain tumor and the lung mass was suspicious assurances deces...they could do tests but it was over 7 days since my boy had eaten. He would never survive the tests let alone the treatment. Hope our situation is not the same. A friend that rescues Golden Retrievers said one of his dogs has seizures but comes out without issues. It's just horrible thing to experience our fur babies going thru it. I advise you especially to have a CT scan because this kind of disease could slow down the physical development of the dog. kingalls wrote: How is your Chowgirl doing? Is she eating? My Chowboy had a seizure. The vet suspected a brain tumor but also found a large mass near his lung in an x-ray. The oncologist said there was probably a brain tumor and the lung mass was suspicious...they could do tests but it was over 7 days since my boy had eaten. He would never survive the tests let alone the treatment mutuelles Entreprise. Hope our situation is not the same. A friend that rescues Golden Retrievers said one of his dogs has seizures but comes out without issues. It's just horrible thing to experience our fur babies going thru it. Mine also had a crisis a week ago. I took him to the veto, but nothing did. So I asked a friend for advice. 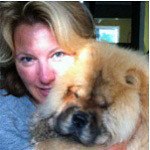 My chow, who will be 10 years old in a week, has had seizures since he was a puppy. He may have one every couple of months, they've increased as he got older but there would be periods where he would not have any for a few months, or at least that we didn't see him having. The actual seizure of physical symptoms last 5-8 minutes, he handles each one a bit different and after 15 minutes you wouldn't even know he had one UNLESS you feel his 'bib' chest for wetness from the drooling. We keep him as comfortable as possible and untuck his legs if they're caught under him. We haven't witnessed one in the last 4 months or more, although I've suspected them. Vet gave us treatment options and warned us they may become more frequent. He is such a good chow, he doesn't look at anyone or any dog around him when he's around a lot of people he just minds his own business. He's brought so much joy to our life with how silly he can be, what an amazing boy. I think stressful sounds like fireworks storms and when we're off from work he stays awake more, I think that is what causes his seizures..... I always wondered if it was diet or pituitary related so I just make sure he gets a good diet and if we share people food it's lean meat, and no sauces on it.